There is a common misconception among the critics of free global investment markets that political oppression and capitalism go together. Their view entails the idea that, throughout history, states have sacrificed civil liberties in pursuit of economic development. This view point originates primarily from the isolated example of Augusto Pinochet, the dictator of Chile from 1970-1990. During his rule, Pinochet ordered both that thousands of political opponents be killed, and that Chile be transformed into a free market economy. Fortunately, Pinochet is an (over-referenced) exception to a general rule: the trend throughout history has instead been that nations with well-protected political rights and civil liberties tend to also have well-developed capital markets. There is a clear correlation between strong protection of human rights and having highly-investable modern economies. In order to examine the human rights record of a country, we looked at Freedom House’s Freedom of the World report. Freedom House separates their scoring of state’s human rights protection into two categories: Political Rights and Civil Liberties. More information about Freedom House and their methodology can be found on their website. Freedom House tracks the human rights records of 195 countries, going back to 1972. Countries are given a score of 1 through 7, 1 being the most free and 7 being the least free. In 2012, the average human rights score for all 195 countries was 3.3, and the average score of the 35 countries for which MSCI had, at the time of this report, distinct ETF investment vehicles (not counting the U.S.) was 2.1 out of 7. In other words, the most investible countries in the world with the most well developed, liquid and accessible stock markets have materially lower levels of civil and political repression. Out of these 35 countries, Freedom House’s 2013 report categorizes 21 as “free.” 7 are listed as “partly free,” and 2 as “not free”. Below are charts that illustrate this pattern in clear terms: orange countries are those with investable economies; blue countries are those whose economies are underdeveloped. The relationship here is clear: ‘orange’ states tend to score far better, which in this case means closer to ‘0’, than ‘blue’ states. The real fact of the matter – that civil and political freedom is a characteristic of nations with developed economies – is unmistakable. 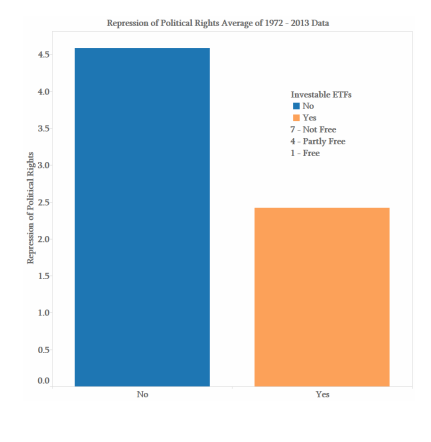 This chart shows the average score on Political Rights for all non-investable (blue) and investable (orange) states from 1972 to 2013. Orange states on average perform twice as well as blue states on their protection of PR.